negotiating right-of-way: avoiding other motor vehicles/pedestrians/cyclists, clearing intersections, completing turns, etc. As noted by California’s Commission on Peace Officer Standards and Training (CA POST) in their 2009 Driver Training Study, speed was a contributory factor in 83 percent of law enforcement traffic fatalities during their study period (and the primary factor more than a third of the time). Right-of-way issues and turns typically occur at intersections. Intersections have consistently been identified as danger points for traffic collisions. Officers routinely have to negotiate intersections under emergency conditions, which increases the collision potential. 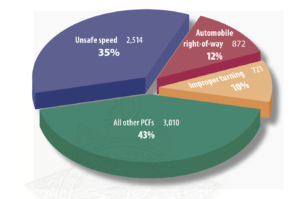 In their 2009 study, CA POST highlighted Sacramento’s long track record of proactive risk-reduction with all municipal driver training (e.g., police, emergency vehicle operators, etc.) These policies “resulted in a consistently low accident rate for many years.” In the specific case of the Sacramento Police Department, CA POST attributed the exceptionally low accident rates both to a comprehensive basic academy driving program and ongoing re-training. In contrast to the norm in California, Sacramento PD’s basic police pursuit driver training program included high-speed driving, night driving, avoiding interference vehicles, and an “aggressive two-day in-service program” that used both LEDS-based and EVOC (i.e., traditional “closed course”) training. The Fire Department of the City of New York (FDNY) began relying more heavily on LEDS-based training in the early 2000s. Specifically, they aimed to increase driver safety among their ambulance drivers. (EMTs face many of the same driving risks as on-duty police officers, especially at intersections.) In the three years following FDNY’s implementation of a LEDS program, they saw a steep reduction of intersection collisions—even as call volume and the number of units on the street steadily increased. SPEED: We know that speed plays a major role in law enforcement crashes. Training at speeds near those reached during emergency vehicle operation is the only way to prepare officers for the emotional and hard-skill demands of high-speed driving. INTERFERENCE: Right-of-way issues (especially at intersections) compound the risk associated with speed. Training must include interference vehicles in order to be effective. TECHNOLOGY: New technologies don’t just make it possible for emergency vehicle operators to safely train at high speeds and while avoiding multiple interference vehicle(s). They offer additional tools (including scenario customization, repetition, geo-specific databases, and after-action analysis) that make for significantly more effective and lasting training.